Madison Avenue on the Upper East Side is America's largest luxury shopping district, containing 400 establishments in this 1.5 mile historic area. 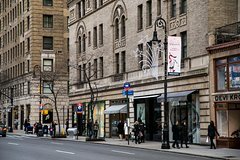 Madison Avenue features the flagship boutiques of the finest fashion houses and jewelry designers; celebrated restaurants; internationally renowned hotels; The Met Breuer museum and 100 galleries. Madison Avenue exhibits timeless elegance with a contemporary flavor that's distinctively New York. • The Madison Avenue Business Improvement District, the official business association of this world famous shopping area, is offering a half- day (four hour) personal luxury styling experience with expert personal shoppers who know what it takes to make you look and feel your best. • Prior to your visit, your stylist will contact you to learn more about your personal likes and needs so that your visit to Madison Avenue is as pleasant and fulfilling as can be. • Round-trip transportation in a luxury town car to and from your hotel, as well as between all shopping stops is included. • If required, a translator shall accompany the guest throughout the stylist experience. • Lunch at a Madison Avenue restaurant is included, including one alcoholic beverage. Guests may bring a companion to the lunch.